Guns — their presence, and all it portends — are increasingly invading every corner of our every day lives. They have morphed into a form of symbolic speech that threatens to shoot down our political discourse. It seemed almost too good to be true, when the National Rifle Association issued a press release criticizing the recent antics of “open carry” activists. It was too good to be true. The NRA quickly reversed itself, and apologized. “Open carry” activists are gun owners who insist upon the right to openly carry their firearms, everywhere. Open carry protests at restaurants like Chipotle, Sonic, Starbucks, and Chili’s have led those chains to prohibit firearms in their restaurants. Polling places may be next. Families attending a children’s baseball game in Forsyth County, Georgia, were alarmed by a man walking around the parking lot randomly displaying his gun and saying, “You want to see my gun? Look, I got a gun and there’s nothing you can do about it.” Georgia recently made it legal to carry guns just about anywhere. On Memorial Day, open carry activists in Fort Worth Texas harassed and threatened a former Marine who spoke against them. They followed him through traffic, taunting him, and threatening to publish his license plate number. Members of the group published video of the incident online. The open carry movement dates back as far as 1967, when armed members of the Black Panther Party marched on the California State capitol in opposition to a law against carrying loaded firearms in public. The movement died down until 2000, when members of the New Black Panther party joined other groups in protesting the death sentence conviction of Gary Graham by openly carrying shotguns and rifles at the Republican National Convention in Houston, Texas. In 2008, the open carry movement experienced a revival, and a transformation in look and tone, with Barack Obama election to the presidency. Patrick Blanchfield, writing in the New York Times, notes that guns have increasingly appeared in the public square since Obama’s 2008 election victory. Open carry activists began showing up at Obama’s campaign events, and later at events where President Obama was appearing or speaking, openly displaying handguns and assault weapons. Guns carried at political rallies and open carry protests have morphed into a kind of “symbolic speech” recognized by courts as protected by the First Amendment. Distressing, and outrageous speech — even calls to overthrow the government — is protected, unless intended to provoke illegal acts. Injecting guns into our political discourse not only pits the First Amendment against the Second Amendment, but also transforms the nature of protest. The courage of one’s convictions is no longer enough. “The physical bravery to face down men with guns,” while armed with nothing more that your ideas, is now also necessary. This is how the right shoots down political discourse. What guns “say, as symbolic speech, has everything to do with who wields them. Republicans are twice as likely to own a gun as Democrats. White Americans are twice as likely to own a gun as people of color. Southerners are 50 percent more likely to own guns, than anyone else. Half of men are gun owners, compared to 13 percent of women. 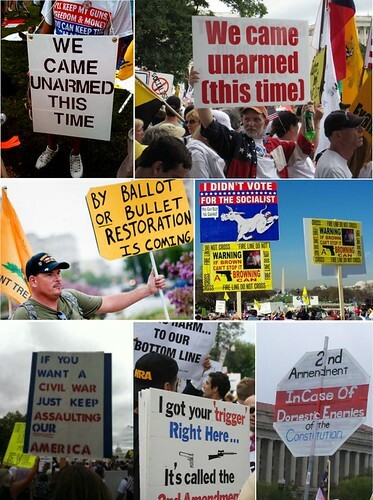 David Frum wrote, “[T]he core gun constituency looks a lot like the Tea Party on the firing range.” The same is true of the open carry protests. Right-wing author and pundit Ann Coulter once wrote that conservatives need to “physically intimidate liberals, by making them realize that they can be killed, too.” In an era when mass shootings are so common that pundits tell us we just need to accept that “there will always be mass murder,” and almost all public spaces — schools, offices, shopping malls, restaurants, bars movie theaters, churches, and polling places — are potential shooting galleries, is it just a matter of time before what was once just right-wing eliminationist rhetoric becomes reality?